Project involves the replanting of degraded peat swamp area equivalent to 24 football fields. (left to right) Hulu Selangor District Forestry Officer Syed Mohd Adzha Syed Mohd Khalid, Sime Darby Plantation Central East Region Chief Executive Officer Mohd Azlan Shah Mohd Zain, Yayasan Sime Darby Education and Community & Health Projects Head Muzdalifah Mohd Nasir, Sime Darby Plantation Sustainability and Quality Management Head Tang Men Kon, Yayasan Sime Darby Chief Executive Officer Puan Hajjah Yatela Zainal Abidin, Global Environment Centre Director Faizal Parish, New Britain Palm Oil Limited Chairman Dato’ Henry Barlow and Bukit Talang Estate Manager Ahmad Zairil Zainal at the tree planting site in the Raja Musa Forest Reserve. BESTARI JAYA, 28 March 2017 – Yayasan Sime Darby (YSD) has planted 18,500 tree saplings on 20ha of degraded peat swamp area in the Raja Musa Forest Reserve in an effort to reduce risks of forest fires that have occurred in the area almost annually since 1992, especially during the dry season. Located next to Sime Darby Plantation’s Bukit Talang estate, the total replanted area is equivalent to the size of 24 football fields. This effort aims to ultimately reduce greenhouse gas emissions, prevent peat land fire as well as haze. Furthermore, the planting of tree saplings will promote the natural regeneration of approximately an additional 30ha of degraded site, with the control and management of water levels in the area. YSD’s initiative, in collaboration with The Global Environment Centre (GEC), the Selangor Forestry Department (SFD) and Friends of North Selangor Peat Swamp Forest (FNSPSF) – involves a three-year commitment of RM1 million which began in January 2014. 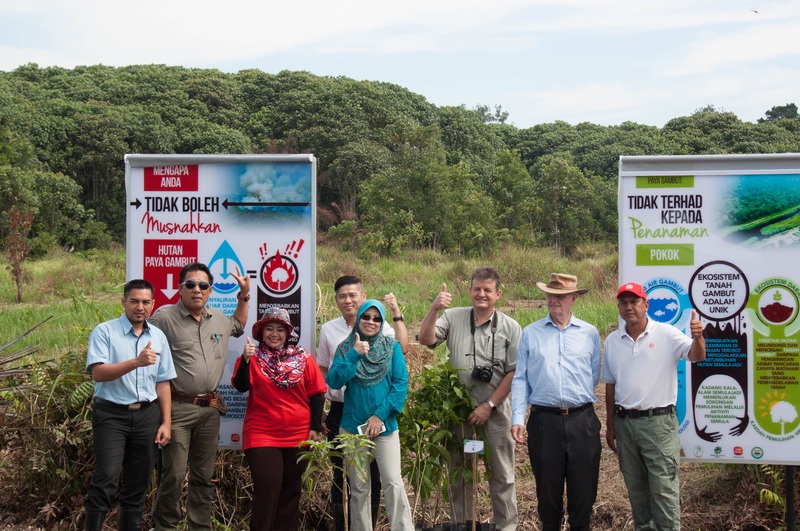 YSD Chief Executive Officer Puan Hajjah Yatela Zainal Abidin said the project involved the planting of Tenggek Burung (Melicope lunu-ankenda) saplings, which are indigenous to peat swamp areas and was completed in the fourth quarter of 2016. She said the water management strategy for the 20ha area will be finalised by the first quarter of 2017. “YSD is working with Sime Darby Plantation to restore the water table in the area by partnering with local communities to create and manage water canals. “The water canals are important to maintain the water levels of the peat swamp, allowing it to act as a carbon sink and protect the habitat for precious wildlife,” she said. The area has been highly susceptible to forest fires due to illegal encroachment in the forest reserve for agricultural activities and unsustainable logging practices. This rehabilitation initiative will serve as a link to the ASEAN Peatland Management Strategy, which was developed in 2003 to tackle transboundary haze pollution in the Southeast Asian region caused by fires in peat areas. It will also support the implementation of the Malaysian National Action Plan on Peatlands adopted by the Malaysian government in early 2011. The project has also supported the livelihood of the local community as the GEC purchases seedlings from nurseries operated by the community and increasing their knowledge on sustainable agricultural practices via GEC’s awareness and training sessions. GEC Director Mr Faizal Parish said since 2014, GEC, together with YSD, SFD and FNSPSF, have implemented the project to enhance and strengthen efforts for peat water management and fire prevention in addition to the rehabilitation and conservation of an area in the Raja Musa Forest Reserve adjacent to Sime Darby Plantation Raja Musa Division. “In future, we will expand our work to support peatland management and rehabilitation in other parts of NSPSF in collaboration with YSD and Sime Darby Plantation,” he said. SFD Director Dr Mohd Puat Dahalan said the implementation of the project has directly assisted action at one of the fire prone areas in the south of the Raja Musa Forest Reserve, in line with the Integrated Management Plan for North Selangor Peat Swamp Forest 2014 to 2023. “The Department is very thankful for this smart partnership with GEC and YSD and we are looking forward to continue this partnership to improve the understanding of the threatened biodiversity in North Selangor Peat Swamp Forest as well as enhancing protection. “We hope other companies will follow this excellent example set by Sime Darby to support the protection, rehabilitation and community engagement to rehabilitate Selangor’s peat swamp forests,” he said. FNSPSF Chairman Mr Sariat Kadot said the project has delivered economic, social and environmental benefits simultaneously to the community. “It raised our awareness on peatland fires and empowered us with best management practices to prevent fires happening at the source. The project also provides additional income for the community as seedlings are procured from the community-run nursery. We have also engaged the community in reforestation activity,” he said. YSD has planted close to 870,000 trees across four projects namely; a collaboration with the Northern Ulu Segama Forest Reserve (248,972), Nestle on project RiLeaf (481,630), Plant-A-Tree project with Sime Darby Plantation (117,724), in addition to the peat swamp rehabilitation. For the second consecutive year, Yayasan Sime Darby’s Environment Day 2017 event will be held on 9 May 2017 at the Kuala Lumpur Performing Arts Centre (klpac). The day-long event open to all will include exhibitions, talks, workshops, competitions and documentaries revolving around the importance of the environment in an age defined by climate change and the ways in which we can help protect and conserve the environment.